The giant kelp (Macrocystis pyrifera) forms an important and distinct community type by creating a habitat of outstanding ecological and economic significance (Johnson et al., 2011). Over the past few decades, there has been a dramatic decline of M. pyrifera on the east coast of Tasmania due to changes in temperature and/or nutrients from the increased influence of the East Australian Current (EAC) in the region (~ 350km further south) (Ridgway, 2007). Warm and nutrient poor waters in eastern Tasmania have caused an overall decline of ~90% in M. pyrifera beds forming dense surface canopies between 1946 to 2007 (Johnson et al., 2011). The most considerable decline has occurred at Freycinet Peninsula (95%) and around Bruny Island (98%) (Johnson et al., 2011). This extensive decline of M. pyrifera in Tasmania waters has triggered a recent Environment Protection and Biodiversity Conservation Act 1999 (EPBC) nomination as a threatened ecological community, which is currently being considered by the Commonwealth. This project provides results needed immediately by the government for conservation management of M. pyrifera. The study will investigate the use of the Red Edge Position (REP) index derived from RapidEye imagery to extract a signal indicating M. pyrifera. Current terrestrial applications of REP include crop monitoring and yield prediction, ecosystem disturbance detection, photosynthesis modelling, and canopy stress caused by climate and other factors. The application of REP to the marine environment is a novel and significant aspect of this study. The practical methodology to be developed in this project has the potential to inform broader conservation strategies by applying the techniques to other marine algal species for high resolution and accurate monitoring. Climate change is altering ecosystems at an unprecedented rate, therefore high quality data possessing and a high degree of temporal and spatial coverage is needed to efficiently guide planned marine adaptation responses. Remote sensing based on satellite imagery may prove to be effective in such a capacity. Johnson, CR, Banks, SC, Barrett, NS, Cazassus, F, Dunstan, PK, Edgar, GJ, Frusher, SD, Gardner, C, Haddon, M, Helidoniotis, F, Hill, KL, Holbrook, NJ, Hosie, GW, Last, PR, Ling, SD, Melbourne-Thomas, J, Miller, K, Pecl, GT, Richardson, AJ, Ridgway, KR, Rintoul, SR, Ritz, DA, Ross, DJ, Sanderson, JC, Shepherd, SA, Slotwinski, A, Swadling, KM & Taw, N 2011, ‘Climate change cascades: Shifts in oceanography, species’ ranges and subtidal marine community dynamics in eastern Tasmania’, Journal of experimental marine Biology and Ecology. Ridgway, K 2007, ‘Long-term trend and decadal variability of the southward penetration of the East Australian Current’, Geophysical Research Letters, vol. 34, no. 13, p. L13613. I can only compare these great aquatic forests of the southern hemisphere with the terrestrial ones in the intertropical regions. Yet if in any country a forest was destroyed, I do not believe nearly so many species of animals would perish as would here, from the destruction of the kelp. In The Voyage of the Beagle (1909) by Charles Darwin. pp. 244-245. Edited by Charles W. Eliot, Editor,The Harvard Classics , Vol. 29, 1909. In 2012, Lewa gave enormous support to the Lynchpin program in many ways, including the making of Forests of the Sea – the film made with artist Malou Zuidema in conjunction with the Hobart City Council Urban Smart Project. Read more about the story behind this delightful film by going to 2012 and scrolling down the page to the heading: What is the link between Charles Darwin and a Traffic Signal Box in the Hobart CBD? Lewa and Malou at the Hobart City Council’s Urban Box Project presentation evening, 2012. Lewa’s Giant Kelp research links with a new project ‘Latitude‘ planned for 2012: a collaboration between Marine scientist and artist Dr Karin Beaumont and Aboriginal artist, Vicki West. The works will highlight the relationships between Tasmanian and Subantarctic coastal environments to focus attention on the importance and fragility of our unique natural heritage. Watch Karin and Vicki talk about their work for this exhibition. At the time of the exhibition, Lewa Pertl recorded an interview with Karin as she spoke about her work in general and the collaboration for this collection in particular. We hope to edit and finalise this footage for viewing as a way of promoting Karin’s expertise and the arts/science edge demonstrated within her work. Karin spent two summers in Antarctica researching the role of microscopic plankton in climate change for her doctoral thesis. Inspired by the amazing array of microscopic patters and forms in the ocean and ice, she created her first piece of metal sculpture in the diesel mechanics workshop at David Station, Antarctica in 1998. This planted the seed that would later see her embark on combining her creativity and scientific knowledge to make jewellery and objects that carry meaning and promote dialogue. To date, Karin has undertaken seven voyages to the Antarctic continent and continues to journey there approximately every two years, gaining inspiration for new works and fuelling her passion for combining science and art in contemporary design. 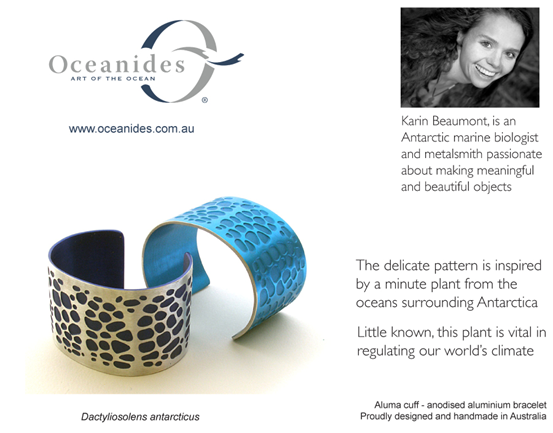 Karin’s jewellery has been exhibited nationally and internationally in France, USA, Singapore and Argentina. In 2007 she was awarded the Australian Government’s Young and Emerging Artist Mentorship (Tasmania) to undertake a mentorship program with renowned contemporary jeweler Marian Hosking, and in 2008 was awarded a product development grant to work with esteemed Australian designer Robert Foster (Fink & Co.). 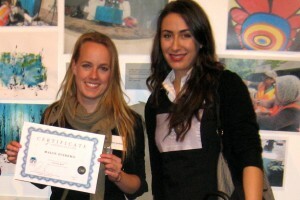 She has twice been selected to participate in Tasmania’s Design Island workshops with international designers Interware (Italy), 2007 and David Trubridge (New Zealand), 2009. Most recently her work has been published in Art & Science NOW, S. Wilson, Thames & Hudson, 2010.